Not to be confused with Platen or Diskos (record label). A paten, or diskos, is a small plate, usually made of silver or gold, used to hold Eucharistic bread which is to be consecrated. 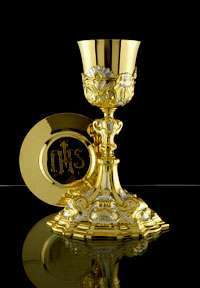 It is generally used during the service itself, while the reserved sacrament are stored in the tabernacle in a ciborium. In many Western liturgical denominations, the paten is typically either a simple saucer-like plate or a low bowl. A smaller style paten will often have a depression that allows it to securely sit on top of the chalice. In more traditional denominations or parishes, altar servers may also use a small paten, usually attached to a short pole, which is placed under the chin of those receiving the Eucharist on the tongue; thus if the host accidentally falls, it would land on the paten rather than the floor. "Sacred vessels should be made from precious metal. If they are made from metal that rusts or from a metal less precious than gold, they should generally be gilded on the inside." However, provisions for vessels made from non-precious metals are made as well, provided they are "made from other solid materials which in the common estimation in each region are considered precious or noble." 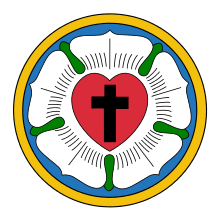 It is also used among Lutherans. In the Byzantine Rite Orthodox and Byzantine Rite Catholic Churches, the paten is called a diskos and is elevated by a stand (or "foot") permanently attached underneath. The diskos is usually more ornate than its Latin Rite counterpart, and must always be made of gold or at least be gold-plated. The diskos may be engraved with an icon of Jesus Christ, the Nativity of Christ, the Cross, or most frequently the Theotokos. 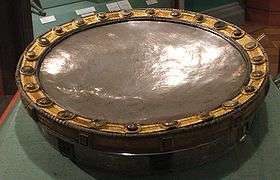 When a diskos is made, it is usually accompanied by a matching asterisk (small, folding metal stand used to keep the Aër from disturbing the particles on the diskos), a spoon (for distributing Holy Communion to the faithful), and a spear (used to cut the Lamb during the Liturgy of Preparation). For Christians of historically Eastern church families, the diskos symbolises the Ever-virgin Mary, who received God the Word into her womb and gave birth to him, as well as the Tomb of Christ, which received his body after the Crucifixion and from which he resurrected. During the Divine Liturgy it is not only the Lamb (Host) that is placed on the diskos, but also particles to commemorate the Theotokos, the Saints, the living and the departed. Thus, on the diskos is represented the entire Church: the Church Militant and the Church Triumphant, arrayed around Christ. At the Great Entrance the deacon carries the Diskos, holding the foot of the diskos at his forehead. He then kneels at the side of the Holy Table, and the priest takes the diskos from him and places it on the Antimension. During the Anaphora, only the Lamb is consecrated. "Wash away, O Lord, the sins of all those here commemorated, by Thy precious Blood, through the prayers of all Thy saints." Sometimes, when a bishop celebrates the Liturgy, a smaller diskos is prepared for him with a small prosphoron from which he takes particles to commemorate the living and the departed before the Great Entrance. During the Consecration of a Church, a diskos is used to hold the relics of the saints which will be sealed in the Holy Table and antimension by the bishop. When a priest is ordained, a portion of the Lamb will be placed on a small diskos and given to him, as a sign of the Sacred Mysteries which are being entrusted to his care. In the Russian tradition, there is a special service of blessing used to sanctify a diskos before its first use at Liturgy. The diskos may be blessed separately or together in a set with the other sacred vessels. The blessing is normally done immediately before beginning of the Liturgy of Preparation, after which the priest carries the diskos into the sanctuary and begins the service, using the newly blessed vessel in that Liturgy. Up until the first time a diskos is used in the Divine Liturgy it is considered to be an ordinary vessel, and may be touched by anyone. However, after having been used in the Divine Liturgy, a diskos may be touched only by a deacon, priest or bishop. A subdeacon may touch the sacred vessels, but only if they are securely wrapped in cloth. When not in use, the chalice, diskos, and all the sacred vessels should remain on the Table of Oblation (prothesis), wrapped in their cloth bags—either sitting on top and covered with a cloth, or stored securely in a cabinet built into the prothesis. In the usage of the Coptic Orthodox Church, the diskos usually has a flat bottom with no foot. Additionally, it has a raised edge, forming a relatively high rim, preventing particles of the offered elements from falling to the floor. Wikimedia Commons has media related to Patens.